The Meditub 2739 is a uniquely designed reinforced fiberglass acrylic walk in tub with a right side door. It allows for installation in small areas such as a shower stall, mobile home, closet or a laundry room. Enclosed on three sides, the free standing design allows you to enjoy the luxury of independent bathing anywhere you want! 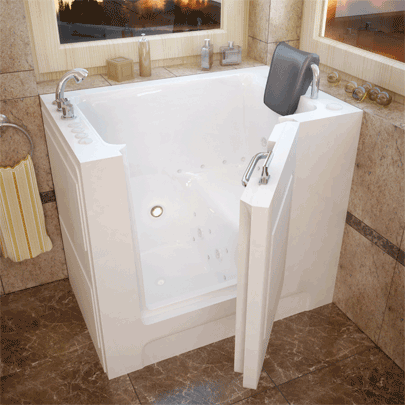 Just sit down and be embraced by the warmth and healing from your new tub from Meditub™. This tub incorporates a stainless steel frame for long lasting strength and adjustable feet for easy installation and leveling. Deluxe Hydro Massage System. 1 horse power pump with directional water jets. The Deluxe whirlpool massage system includes (h_jet) 360° color matched, directional and adjustable water jets. Each individual water jet is also fully adjustable as far as pressure or velocity of water also included is a FREE Inline Heater which maintains a consistent water temperature, rated at 15 Amps 125 Volts AC, 1 Nema Plug. The premium air system comes with (a_jet) advanced warm air bubble massage jets and is adjustable up to three speeds. Air system is assembled with self cleaning feature also includes a free 300 watt Internal Heater, rated at 15 Amps 120 Volts AC, 1 Nema plug. Dual Massage System combines Hydro & Air System to provide a truly luxurious bathing experience. Dual Massage System combines Hydro & Air System to provide a truly luxurious bathing experience. Air Switch finger tip touch controls make adjusting water flow and jet options as easy as touching a button. Enjoy the luxury of bathing once again, simple, safe, comfortable and convenient with a walk-in tub from Meditub. There is no straining or struggling to get in or out of the tub when you own a walk-in bathtub. Makes warm baths or soothing showers accessible to people who thought they’d never enjoy the luxury on their own again. The walk-in tub door, low-entry step (5 in. ), and slip resistant tub floor are just a few of the features that make independent bathing secure in a Meditub. Built-in chair-height seat allows you to conveniently experience a comfortable, full body soak without the struggles of getting up and down. The 2739 is perfect for small bathrooms, Existing shower stalls, Mobile homes, or small areas that a conventional tub cannot fit.